Right here, this is the way to Break The Fast. 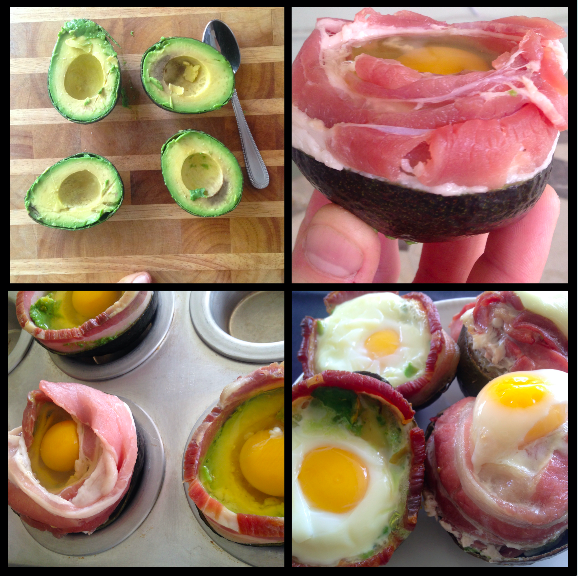 Bacon, Avocado, and then an Egg baked right in the center. Bacon. Mmmm… Sounds amazing. Bacon contains Choline which is a micronutrient that aides in brain development and has many health benefits. BUT steer clear of nitrates, make sure you’re purchasing the right bacon from the right sources. Bacon with MSG will just make you stupid. Avocado contains monounsaturated fat. It’s a healthy fat. The avocado supports nutrient absorption from other foods as well as increasing HDL, the good cholesterol. We all know the egg is an amazing source of protein. Unfortunately, it can be underutilized due to the bad rep it received for contributing to heart disease. As it turns out, that is not true. In fact, our bodies need fat and cholesterol. What we don’t need are refined carbohydrates made from ingredients not found in nature. Carbohydrates make you fat, cause inflammation, and contribute to heart disease. We definitely do not need to be eating Egg Beaters and there is absolutely no reason to be throwing away the yolks. Nourish your body, eat the whole egg. Read Eat the Yolks by Liz Wolfe. Create a separation from the skin and the fruit using a spoon or butterknife. Note* use muffin pan to keep BAE’S upright. Bake at 350 degrees for 25-30 minutes until your egg is done the way you like it. Serve it as is. The skin is very easy to remove from the fruit.